Julian (10) and I spent 4 weeks in Maine. We belong to a club up there that is about the same size as KSC. One difference is that it has a large sailing education program. It operates as a separate non-profit. The sailing education program starts with the Optimist (Opti). At 6 years old students can take rowing. Opti classes start at age 8. 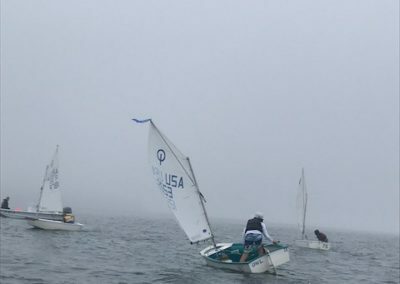 There are 4 levels of Opti instruction: Opti A, B,C, and Race Team. Race Team travels to regattas, but all the sailors partake in the club races. After Optis (age 15 or thereabouts), comes 420s. Again, there are 3 levels ending in a race team. The instructors are paid. There is a program director, and under her 2 instructors for each level and boat. The instructors are drawn from the sailors who came up through their program, but there are a few from elsewhere. There is the real beauty of the program – the instructors are like the pied pipers of sailing. The kids adore them, and will undertake ever more challenging tasks under their direction. Safety is primary. It is a busy harbor and bay. Lobster boats and pleasure craft come in and out of a narrow entrance. It is common to see Opti’s weaving among them, instructors hovering nearby. They have a fleet of Sea Arks and Whalers as coach boats. There is on site first aid training and instructors travel to get First Responder. One interesting thing is the way the instructors politely keep distance between the parents-members, and the sailors during classes. Once class begins the students are 100% under the care of the instructors. Parents volunteer to help at regattas…with travel, food, housing, etc. All the on-water stuff though is professional. Students are taught to take responsibility for their boats. They rig themselves. At the end of the day they help each other to pull their boats from the water, and lift them onto the racks. Race equipment is venerated, and stored separately. All this is under the benevolent dictatorship of the young instructors. Instruction takes place under all reasonable conditions. Optis and 420s fly around the bay in 12-15 knots, easy. Capsized and swamped boats are common, but that is part of sailing and students right the boats and carry on, “sailing and bailing”. Instructors will come and help in the more aggregious cases. If a sailor feels he has reached his limit, he is allowed to make that decision and sail into the harbor, and an instructor will accompany him in a coach boat. Rowing and Opti A classes are in the morning, when wind is typically more light. The instruction is an orderly process emphasizing different skills at each level. First, they just learn to make the boat go in a given direction. They practice tacking, jibing, upwind and downwind on simple courses, sometimes wheeling around a coach boat, or playing chase. There is usually one fun trip a week when they sail to town, walk up to the store, buy treats, sail back. Advanced levels learn to roll tack and jibe, sail downwind on a windward heel, achieve speed. Eventually the emphasis is on starts, rules, and tactics. Opti C races once per week, Race Team, every day. Classes are every day over 2 week sessions. Since the program is progressive, a student can take 4 sessions during the summer, and expect to continually learn new things. When I was a kid there, there was no separate sailing education program. Everything ran from inside the club itself, and classes were for members’ kids. Now the classes are open to the community and it is a huge success in terms of numbers. It has also spawned a 420 race program at the high school. The sailing education program makes enough money to pay the instructors. Equipment costs are split with the club. There are adult lessons too – using two club-owned Rhodes 19s. Instructors moonlight to do those lessons, which happen mainly in evenings and weekends. The education program is multi-layered, integrating with larger boats. During series races Instructors will place their race team sailors as crew on the keelboats. There is a “big boat” day, when students get to sail on some of the largest yachts there – including the 74 foot Dragonera. Julian ended the summer in an Opti regatta in Portland. 82 boats were there in two primary fleets. The host club was crawling with kids, boats were occupying every corner. Opti regattas are hosted all over the US and world – a global community. It is fun to see the large variety of rigs that pull into the parking lot – Optis piled high on minivans, chase boats being towed covered in Optis, and specially designed trailers. Opti regattas have several fleets based on age and experience. The Green Fleet is for sailors new to regattas. There is instruction on the course, and the emphasis is on participation, not scores. Although you can see the young skippers tracking their finishes, closely. The Championship fleets are more serious including protests, protest hearings, the whole 9 yards, and range up to 15 years of age. The Opti is not a great light air boat. It is at its best in a good breeze. Sunfish are the better craft for Keowee. Sunfish regattas and training programs abound. It is neat to see the instructors there who started as Opti kids, graduated to 420s, and went on to sailing adventures in college and later. The idea of paying it forward is strong. And, parents are grateful for the summer employment it offers their kids. The young instructors have a lot of responsibility in a closely-watched environment. On at least one occasion, a parent who was on the porch watched as a squall came in, and boats went every which way. He hopped in his boat and came out to help. Not needed, but still welcome. Click here to make them. © 2019 Keowee Sailing Club, all rights reserved.